Since the industrial revolution manufacturers have focused almost exclusively on building and producing goods, either for use in other businesses' products or directly for end markets. But that is beginning to change. For a growing number of advanced manufacturing and technology (AMT) businesses, evolving the value proposition now means more than simply developing newer, better products, but repositioning themselves as service providers. This represents a complete overhaul of established business models. “Servitisation” is based on all-round and continuing service, rather than a one-off transaction. It means, for example, an aerospace engineering firm guaranteeing its customers an agreed number of flight hours or a maximum outage level over the course of the year, rather than simply selling an engine; or automotive manufacturers offering a subscription service, which would allow the company to tag on additional services and provide a more complete service to customers via AI. 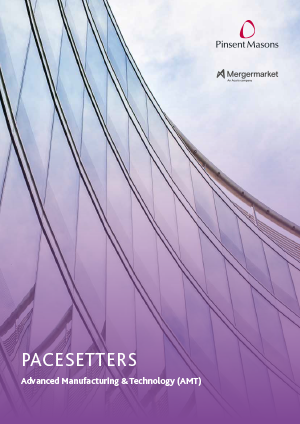 Research for our new Pacesetters (AMT) report shows that a substantial majority (61%) of the fastest-growing AMT businesses anticipate earning at least 40% of their revenues from services within the next three years, up from just 17% who do so today – with only 5% who were pursuing servitisation three years ago. The era of servitisation has begun.